Ready to have a memorable evening on a day that celebrates love? Please come enjoy a stress free Valentine’s Day, where Project XO has done all the planning for you and your significant other. 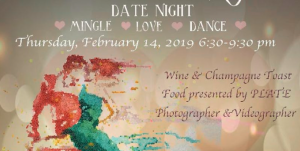 Don’t miss the chance to mingle, dance, and toast to love in a uniquely fun and romantic setting where all you have to do is show up! Also, the bar at The Station will be open to purchase more drinks if you would like throughout the evening.